Don Hanawalt joined The Dow Chemical Company as a Physicist in 1931 and became a Corporate Vice President by 1953. While Director of the Spectroscopy Laboratory in 1936, Don wrote his famous paper with co-author Sid Rinn on “The Identification of Crystalline Materials” which, along with a 1938 publication, are considered the foundation of powder X-ray diffraction as an analytical technique. Upon retirement in 1964, Don became Professor in the College of Engineering at the University of Michigan. He is also famous for his pioneering work in magnesium processing and alloy production. Don served as ICDD Chairman of the Board of Directors from 1976-1978. This award is named in honor of J. Donald Hanawalt, whose pioneering work in the 1930s led to the development of the PDF database structure and search/match procedures still in use today. The purpose of the award is to recognize distinguished, recent work in the field of powder diffraction. The award is presented every three years. Awardees are chosen by the Hanawalt Award Selection Committee, which is comprised of past recipients. Work eligible for consideration must have been published within the past five years. The Hanawalt Award is presented at an appropriate powder diffraction/crystallographic meeting. The recipient is expected to submit an abstract and present a paper on the work being recognized. The award consists of a commemorative plaque, a gift of $1,000, and the recipient’s travel expenses to the meeting, in accordance with ICDD’s Travel Policy. Nominations of candidates may be submitted to the Chairman of the Hanawalt Award Selection Committee (see below) by completing a Nomination Form. In addition to the nomination form, the candidate’s curriculum vitae must be sent via e-mail to awards@icdd.com. Newtown Square, PA 19073-3273 U.S.A.
Submissions must be made by 1 October for the next year’s award. Professor Leoni’s award and associated lecture were given at the 2016 Denver X-ray Conference (DXC) in Chicago, IL. His lecture, Detailed Microstructure Information from Powder Data: A Maze or Amazing?, was presented during the DXC Plenary Session. Professor Leoni received his Master in Materials Engineering at the University of Trento in 1995, and Ph.D. in Materials Engineering at the University of Rome “Tor Vergata” in 1999. After a post-doc experience at the Max Planck Institute for Metals Research in Stuttgart, he returned to the University of Trento to continue his career first as post-doc, then as research professor, and now as Associate Professor in Materials Science and Engineering. Professor Leoni is the elected Chair of the Board of Directors of the ICDD and consultant for the Commission on Powder Diffraction of the International Union of Crystallography. He is currently working on the development, validation and application of novel methods for the quantitative analysis of structure and microstructure evolution of real materials (i.e. materials with defects) using powder diffraction and combined techniques. Of particular interest are those systems showing confined or lacking 3D periodicity (e.g. nano, 2D, layered, intercalated materials and, in general, materials with stacking defects). Dr. Scardi’s award and accompanying lecture were given at the XTOP 2016 – 13th Biennial Conference on High-Resolution X-Ray Diffraction and Imaging, in Brno, Czech Republic. He concentrated on Whole Powder Pattern Modelling of Nanocrystalline and Plastically Deformed Materials during his presentation at XTOP 2016. Dr. Scardi received his B.A. in Physics at the University of Napoli in 1984. Since 1986, he has been a faculty member at the University of Trento, Italy, where he became Full Professor in 2002. Dr. Scardi is currently head of the Ph.D. school in Civil, Environmental & Mechanical Engineering (formerly Materials Science & Engineering), where he teaches X-ray diffraction applied to engineering problems. Line Profile Analysis has always been a main scientific interest of Dr. Scardi. Early ideas on the whole powder pattern modelling approach, date back to his first years as Assistant Professor, along with the collaboration of several students, among them, Professor Matteo Leoni, co-winner of this award. Research interests span across several themes of materials science and technology, including nanostructured materials, thin films and coatings, residual stress, texture and plastic deformation of materials, with special attention to understand the role of microstructure in developing and modifying material properties and behavior. Since the beginning of his career, Dr. Scardi has been in charge of the local X-ray Powder Diffraction laboratory, an activity he still follows today; his work includes measurement studies at synchrotron radiation facilities, dating back to the early 1990s. Recent work focuses increasingly on atomistic modelling, e.g. by molecular dynamics, to support the interpretation of X-ray spectroscopy results, and use of the Debye Scattering Equation to analyze nanostructured systems. Dr. Von Dreele’s research focuses on the development of X-ray and neutron powder diffraction, and its application to a wide variety of scientific problems. He pioneered the General Structure Analysis System program suite for Rietveld analysis, a valuable method for structural analysis of nearly all classes of crystalline materials not available as single crystals. Currently, his work centers on further extensions of protein powder diffraction including investigation of crystal growth, phase transformations, radiation damage and exploring possible routes to de novoprotein structure determination from powder data. Dr. Von Dreele began using the Rietveld method in 1972. He is the author or co-author of more than 150 scientific publications on crystal structure results and techniques, most involving Rietveld refinement. He authored a publication describing the first protein structure solved from powder diffraction data. Prior to joining Argonne in April 2003, Dr. Von Dreele served as Professor of Chemistry at Arizona State University (1971-1987), and was a Staff Scientist at Los Alamos National Laboratory (1987-2003). The J.D. 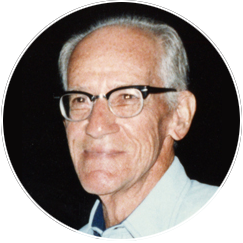 Hanawalt Award is named for Professor J. Donald Hanawalt, whose pioneering work in the 1930s led to the development of the PDF database structure and search/match procedures still in use today. The award is presented every three years for an important, recent contribution to the field of powder diffraction. We extend our sincere congratulations to Dr. Robert Von Dreele! The International Centre for Diffraction Data takes pleasure in announcing that Dr. Takeshi Egami of the Joint Institute for Neutron Sciences, University of Tennessee, Knoxville, TN, and Oak Ridge National Laboratory, Oak Ridge, TN, and Dr. Simon J.L. Billinge of Applied Physics & Applied Mathematics, Columbia University, New York, NY were selected to receive the 2010 J.D. 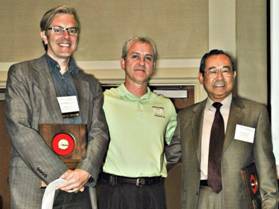 Hanawalt Award for excellence in the field of X-ray powder diffraction. 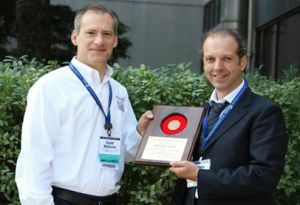 The presentation of the award took place at the 59th Annual Denver X-ray Conference, Denver, Colorado, U.S.A., on 4 August 2010. The Award was established to recognize outstanding achievement in the XRD field within the last five years. Dr. Takeshi Egami and Dr. Simon Billinge were honored for their brilliant work in developing and extending the technique of Pair Distribution Function analysis of non-Bragg structures as exemplified in their book, “Underneath the Bragg Peaks”. 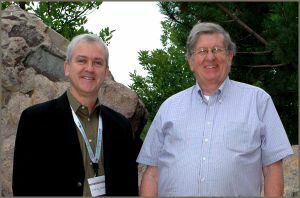 A special session entitled “Nanostructure Studies using the Atomic Pair Distribution Function” was held at the Denver X-ray Conference, where Drs. Egami and Billinge presented their Hanawalt Award lectures. Dr. Egami’s presentation focused on Recent Advances in the Pair Distribution Function Technique, while Dr. Billinge spoke on Structure at the Nanoscale: Atomic Pair Distribution Function Analysis of Nanostructured Materials. Dr. Billinge received his B.A. in Materials Science at the University of Oxford in 1986, and Ph.D. in Materials Science and Engineering at the University of Pennsylvania in 1992. Dr. Billinge first worked at Michigan State University as an Assistant Professor of physics and astronomy, and by 2003 he worked his way up to the title of Professor. In 2008, Dr. Billinge arrived at Columbia University as a Professor, as well as a Senior Scientist at Brookhaven National Lab, Upton, NY. His research includes: nanoscale structure-property relationships in functional nanomaterials studied using novel X-ray and neutron scattering techniques coupled with advanced computing, as well as, solving the nanostructure problem. Dr. Egami received his Bachelor’s degree in Applied Physics in 1968 at the University of Tokyo. In 1971, he received his Ph.D. in Materials Science from the University of Pennsylvania. Dr. Egami began teaching at the University of Pennsylvania in 1973 as an Assistant Professor. He became a Professor in 1980, and then Chair of the Materials Science and Engineering Department from 1997 to 2002. While teaching at Penn, Dr. Egami was Dr. Billinge’s thesis advisor in 1992. Dr. Egami is currently a Distinguished Professor at University of Tennessee, Knoxville and has written over 360 technical papers. Congratulations to Dr. Takeshi Egami and Dr. Simon J.L. Billinge on receiving this prestigious award! The International Centre for Diffraction Data takes pleasure in announcing that Dr. Tamás Ungár of the Department of General Physics, Eötvös University Budapest, Hungary, was selected to receive the 2007 J.D. 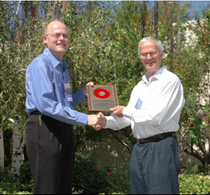 Hanawalt Award for excellence in the field of X-ray powder diffraction. 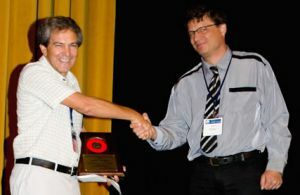 The presentation of the award took place at the 56th Annual Denver X-ray Conference, Colorado Springs, Colorado, U.S.A., 1 August 2007. Dr. Ungár was recognized for his research interests on the dislocation model of strain anisotropy. The Hanawalt Award Lecture, which focused on this subject, was presented by Dr. Ungár in the Denver X-ray Conference Special Session on Stress Analysis. Dr. Ungár’s research includes EXAFS; X-ray small-angle scattering on Al-base alloys; high resolution X-ray diffractometry, especially peak-profile-analysis; the real structure of metals and alloys; dislocation structure and densities; microdiffraction; particle size determination from X-ray diffraction; stored energy from dislocation density; microstructure; and crystallite size and size-distribution. Dr. Ungár began his career as a teacher in the field of physics at Eötvös University Budapest in 1966. He has remained with the University over the length of his career and has taught courses in mechanics and thermodynamics, electricity and optics, solid state physics, diffraction physics, and materials science. He has authored more than 150 publications and his works have received over 1,600 independent citations.